Excellent location and very nice infinity pool at the top with amazing view. The room was for 3 adult and 2 kids. Partment well maintain and clean. Great view from swimming pool and if wish to go clubbing, there one at the same level. Helpful staff when we have some issue with the TV and TV box (settle on the same day). Spacious two bedrooms/two bathrooms apartment with great views and great swimming pool. The host was the BEST! He helped us out with our luggage which got delayed by over 24H and was extremely communicative and proactive! Location coupled with Grab App makes this a great location to be. The gym is nice and the views from the top are also very nice. The WiFi was fast. Spacious rooms. 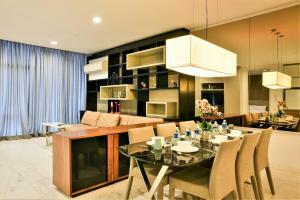 The living room is very big, with multiple equipments, such as washing machine, cooking facilities, microwave etc. Location is very nice, 10 minutes walk to twin towers. The swimming poor located in 51th floor, fantastic view but the water quality need to improve. Everything was perfect. I’m glad we did chose Saba Suites. The best location in my opinion since you can do almost every tourist spot in walking distance (lots of restaurants, malls, seven elevens around). The apartment was very clean and tidy, good size for a family like us. A big “thank you” to the staff who met us at the lobby and did everything to make our stay memorable (sorry I didn’t get his name but he’s the one who will meet you at the lobby and take you to your room/suite, also he will communicate with you through WhatsApp) We will definitely come back to Saba Suites!!! Apartment is so spacious clean with wonderful view! Especially the infinity pool rooftop! Lock in a great price for Saba Suites at Platinum KLCC Bukit Bintang Kuala Lumpur – rated 9.1 by recent guests! 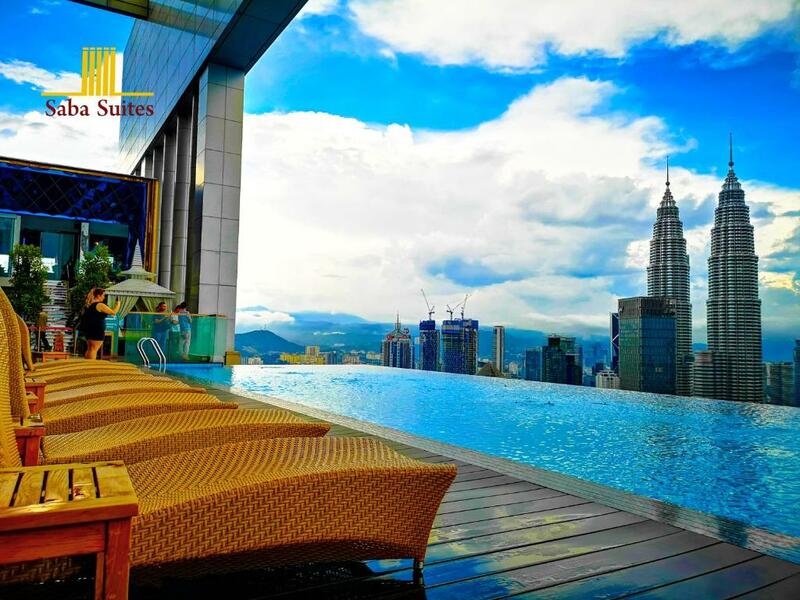 Saba Suites at Platinum KLCC Bukit Bintang Kuala Lumpur This rating is a reflection of how the property compares to the industry standard when it comes to price, facilities and services available. It's based on a self-evaluation by the property. Use this rating to help choose your stay! Set 2,650 feet from Petronas Twin Towers, Saba Suites at Platinum KLCC Bukit Bintang Kuala Lumpur provides accommodations in Kuala Lumpur. Free WiFi is provided and guests have access to the infinity swimming pool overlooking the city. The units provide views of the city and come with a washing machine, a fully equipped kitchen with an oven, and a private bathroom with a hair dryer. There is also a microwave, fridge and a kettle. The property has a fitness center and a tour desk. An outdoor swimming pool and a terrace are available at the property. Suria KLCC is a 10-minute walk from the apartment. Sultan Abdul Aziz Shah Airport is 11 mi away. 뀐 Located in the real heart of Kuala Lumpur, this property has an excellent location score of 9.3! 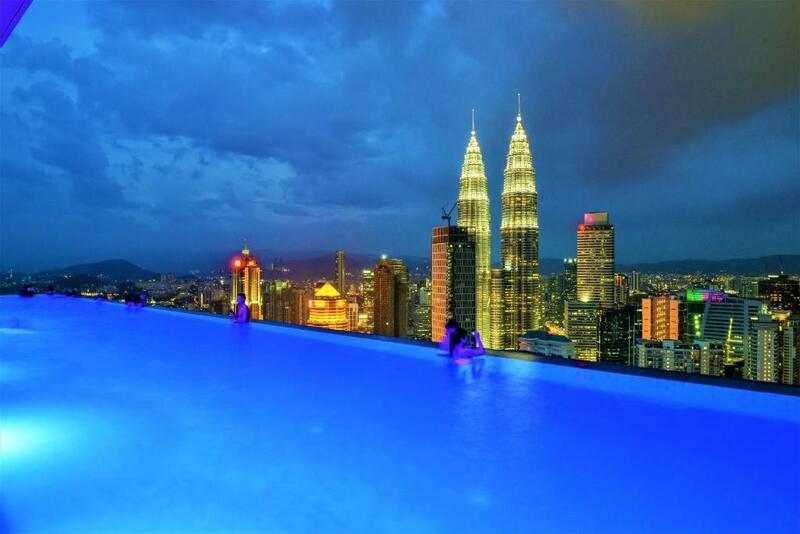 When would you like to stay at Saba Suites at Platinum KLCC Bukit Bintang Kuala Lumpur? This apartment features a fireplace, satellite TV and view. This apartment has a washing machine, dining area and air conditioning. This apartment features a flat-screen TV, tumble dryer and kitchenware. An all-suite hotel located in the heart of Kuala Lumpur comprising of 200 units of sheer luxury and exclusivity with an inspired design and attention to details in the city with a view of stunning Kuala Lumpur's skyline. The suites are fully furnished with an integrated living room, kitchenette that is equipped with modern appliances, bedroom, en-suite bathroom and a work or study area. Other facilities in the suites would be LED TV, and wireless internet access (Wi-Fi), washing machine and dryer, and iron with ironing board. The infinity pool located on the 51st floor offers panoramic views of the Kuala Lumpur's skyline where guests can dip and relax in the pool with views of Petronas Twin Towers and KL Tower as the backdrop. Other facilities available are children's wading pool, gymnasium with the latest gym and cardio equipment. We can facilitate your trip by providing bookings for (Hotel rooms, Airplane tickets, airport shuttle, tourism tours, car renting) anywhere in Asia. We are one phone call away. Saba Suites We speak your language! Strategically located at Jalan Sultan Ismail, Saba Suites is surrounded by major expressways that are easily accessible for cars and public transportation that are within walking distance such as the nearest subway train Dang Wangi LRT and Bukit Nanas Monorail. It is also a short walking distance to the iconic Petronas Twin Towers, KL Tower, shopping malls and entertainments. House Rules Saba Suites at Platinum KLCC Bukit Bintang Kuala Lumpur takes special requests – add in the next step! Any additional older children or adults are charged MYR 60 per night for extra beds. Saba Suites at Platinum KLCC Bukit Bintang Kuala Lumpur accepts these cards and reserves the right to temporarily hold an amount prior to arrival. Please inform Saba Suites at Platinum KLCC Bukit Bintang Kuala Lumpur of your expected arrival time in advance. You can use the Special Requests box when booking, or contact the property directly using the contact details in your confirmation. Huge room. Excellent location. All amenities. Easy getting keys. Room is huge. Pool is incredible. We had handbag stolen in city. Keys and swipe card stolen also. The manager was at our hotel extremely quickly to replace the card, and even changed the barrel on the lock of the door as we were worried the thieves could access our room that night. We had young kids, and we could sleep that night with peace of mind. Outstanding service. Unit was not fitted out very well - basic dinner ware for 4 people , not 5. Sleeps 4, 5th person slept on lounge. Only 4 towels, no hand towels, bath mats etc . No wine glasses . NO HOT WATER . No English TV channels, no pool towels, had to use the bathroom ones, no towel rails to dry anything, & no soap provided. Very spacious, good bathrooms & a great pool with a great view. Bed was rock hard. Air conditioner wasn't adequate for the heat. Woken @ dawn every morning for "Call To Prayer" As it was not a part of the "hotel" room wasn't serviced daily & only 1 toilet roll was left for a 3 day stay. THE WORST BIT... The ONLY reason we booked here was becasue of the Rooftop Pool - It was FILTHY the entire stay! There were "floaties" of who knows what throughout the entire thing, every 5cms or so there was more floaties. Like mould or something. Absolutely putrid. We complained & nothing was done for the 3 days we were there we couldn't swim in the pool or get that desired instagram pic. Nothing thought it was perfect!! Everything here was great would stay here again in an heartbeat!! Very nice, love the infinity pool. Great location and great stuff.